Maintaining top performance and health in horses that compete is of utmost importance to all involved in the equine athlete’s career. The best course of action for owners, trainers and riders who are committed to maintaining their horses’ health is to rely on nutritional supplements and feeding regimens that are time tested and supported by science. 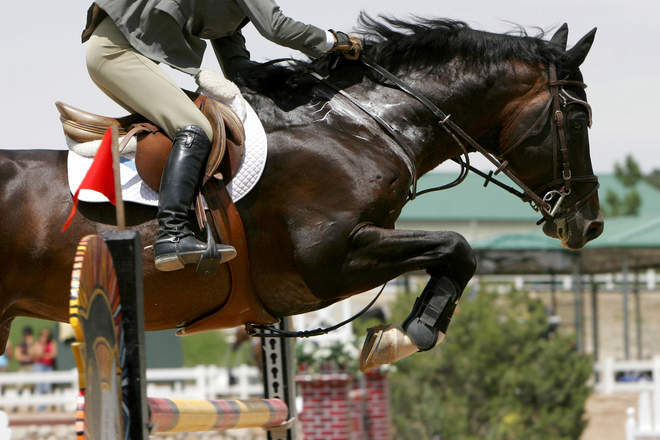 All horses require the same nutrients, but equine athletes need more than pasture and non-competing horses. Research has shown that a balanced diet with the right mix of vitamins and other nutrients, supplemented as necessary, supports optimum health and meets the higher nutritional needs of equine athletes, which is vital to performance. When energy is lacking, so is the will to work, and this is just as true of equine athletes as it is of their human partners. Research shows that the energy needs of high-performance horses in competition are twice as great as those of horses who don’t compete. Therefore, a competition or show horse may not be receiving enough energy from its regular diet to meet these increased needs. Vitamins and mineral supplements may help improve the efficiency of energy utilization and can be of great benefit. Using supplements to provide the right mix of energy, minerals, proteins and vitamins, owners and riders can ensure their horses have the energy and drive to compete at the top of their ability. Fats: Research has shown that fat supplementation may encourage a horse's system to efficiently draw on fat stores and contribute to a more efficient metabolism as well as support higher levels of blood glucose following exercise, especially for horses performing submaximal work. Proteins: Protein is present in most dietary sources but not so much in cereal grains as compared to oil seed meals, for example soybean meal, which contains much higher levels of protein. Balanced amino acids from proteins contribute to supporting healthy body tissue. Concentrates: Concentrates (grain or grain mixes) are feeds containing increased amounts of specific nutrients per unit of weight that are usually more energy dense than forages/roughages. Vitamins: Vitamins are broken into two categories: those that are fat soluble, such as A, D, E and K, and those that are water soluble, primarily B vitamins. Each vitamin contributes to horse health while working in concert with other dietary components to support health and performance. Minerals: An important part of muscle strength and growth, minerals are integral to the equine athlete, particularly calcium, phosphorous, sodium and chlorine. Through proper diet management and supplementation, horse owners may improve performance by helping their horses reach optimum health. Supplements such as Vita Flex® Accel® products can help hardworking horses by adding water- and fat-soluble vitamins, trace and macro minerals, and a guaranteed 18 amino acids to their diet. For well-loved older horses and horses recovering from injury, supplements like Vita Flex® Accel® Lifetime provide the same benefits along with immune system and antioxidant maintenance for balanced nutrition. Depletion of energy, which can affect performance. Decreased bone and hoof density, and related injuries. Lethargy and loss of appetite due to deficiencies in key nutrient levels. Research-based evidence suggests that horses receiving the right balance of vitamins and nutrients not only perform better but are more willing to work and train. Because every horse is different, the task of finding the right dietary program can present a challenge. The full line of Vita Flex® supplements, which includes the comprehensive formulas found in Accel® products to support optimum health, can be incorporated into nutritional management programs for equine athletes across their lifetimes. For more information, visit www.vitaflex.com or call (800) 848-2359.